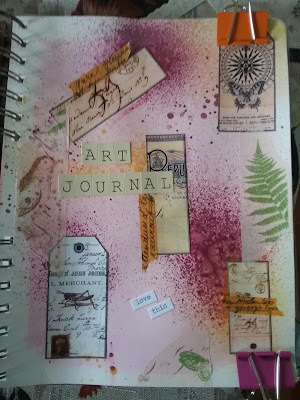 Recently I was reading an article in Somerset Studio's Art Journaling magazine about what inspires us to create. I am often inspired by the things around me; nature, family, music (as per my last post) and the creativity of others. I sat down this week with that question of "what inspires me?" on my mind and came to the conclusion that I am often inspired by what I, myself, have created. A piece of artwork that is created without much forethought or planning, just a freeflow of ideas, and at the end of the process inspires me to create more pieces with like colors, concepts or ideas. This picture I raffled off in a giveaway on Facebook. There are other canvases in this collection that I will add pictures of later. So this week I was inspired by what I create....what about you?